Akshay Shah BS’14, a business analyst at McKinsey & Company, is among the inaugural group of Schwarzman Scholars, 111 “future leaders of the world” who will pursue a master’s degree at Tsinghua University thanks to a new scholarship program sponsored by Stephen A. Schwarzman, chairman and cofounder of the Blackstone Group. The select program is already being equated with the Rhodes Scholar program at Oxford. 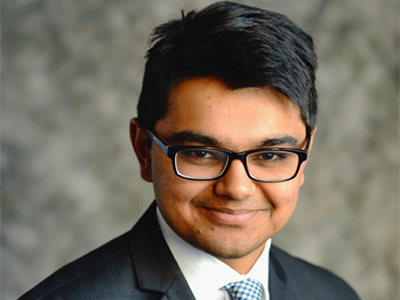 A native of Bangalore, India, Shah was among 3,000 applicants from 135 countries to vie for the opportunity to attend Tsinghua’s new Schwarzman College in Beijing for an all-expense paid, one-year course of study and cultural exchange leading to a master’s degree from one of China’s most prestigious institutions. "I feel lucky and honored to receive the scholarship," says Shah, who plans to study economics at Tsinghua. "It will give me an amazing opportunity to understand and learn from China." As an electrical engineering major at SEAS, Shah conducted research in the Columbia High-Speed and Millimeter-wave IC (CoSMIC) Lab of Associate Professor Harish Krishnaswamy, designing and building a millimeter wavelength passive imaging system. He was Class President for the Class of 2014, served as a Columbia University Senator, helped lead TEDxColumbiaEngineering, and was one of 10 undergraduate students nationwide to win an IEEE Microwave Theory and Techniques Society scholarship in 2012. The Schwarzman Scholars program aims to help talented future leaders change the world at the global scale. The program’s advisory board includes Tony Blair, Nicolas Sarkozy, Condoleezza Rice, Henry Kissinger, and Yo-Yo Ma.